Sarge is tall and lean, an Army veteran who wears camouflage pants and a beanie. At one point in the conversation, he describes himself, in a long drawl, as “a redneck.” He’s one of hundreds of people believed to be camping in the forests around Bend, Redmond and throughout Central Oregon, all in various stages of survival. The volunteers who have come to visit are part of a small outreach program, operated by Central Oregon Veterans Outreach, or COVO, a Bend-based homeless services agency that provides trash pickup to the homeless camps, as well as basic supplies. Four plastic water jugs, the color of Army green, sit on a couch cushion. The jugs get filled with water from a tank in the back of one of the volunteers’ truck. While they wait, the volunteers ask Sarge how he is doing and make small talk. He is referring to trout the volunteers brought during a previous visit. A local sportsmen organization donated 1,000 trout to COVO, which the organization gave out to its homeless clients. Once the water jugs are full, it is time for the volunteers to head to the next camp. They tell Sarge to take care, that they will see him again in a week. Roy Crafts (from left), Merv Abe, Jim Milam and Len de Groot wait as Roy fills four milk jugs with water for a homeless couple that lives in a camper trailer. The four men are volunteers with Central Oregon Veterans Outreach, a homeless service agency in Bend. Each Tuesday, they visit homeless camps around Bend, picking up bagged trash and dropping off basic supplies. SARGE IS ONE OF nearly 30 homeless people the volunteers visit each Tuesday as part of the small outreach program COVO started in response to the growing number of homeless camps in Central Oregon. The volunteers help the campers keep their camps clean and livable. 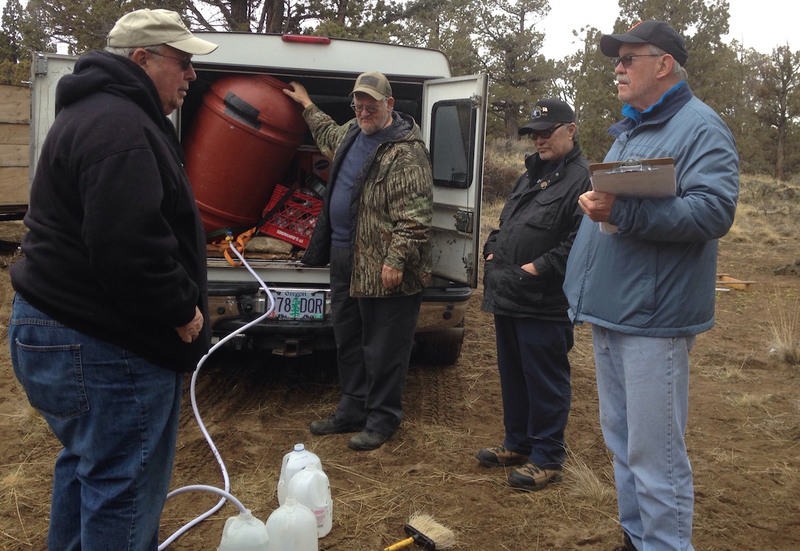 COVO has an agreement with various entities, including the Central Oregon Irrigation District, to allow the COVO volunteers on their land to help the campers in exchange for encouraging people they encounter to clean up after themselves. COVO supplies the campers with garbage bags, and volunteers pick up the filled bags each week and take them to the dump. They also provide basic supplies: sack lunches, one-pound cans of propane, rolls of toilet paper, extra garbage bags and dog food. And they fill campers’ receptacles with fresh water from a 55-gallon tank the volunteers truck in. 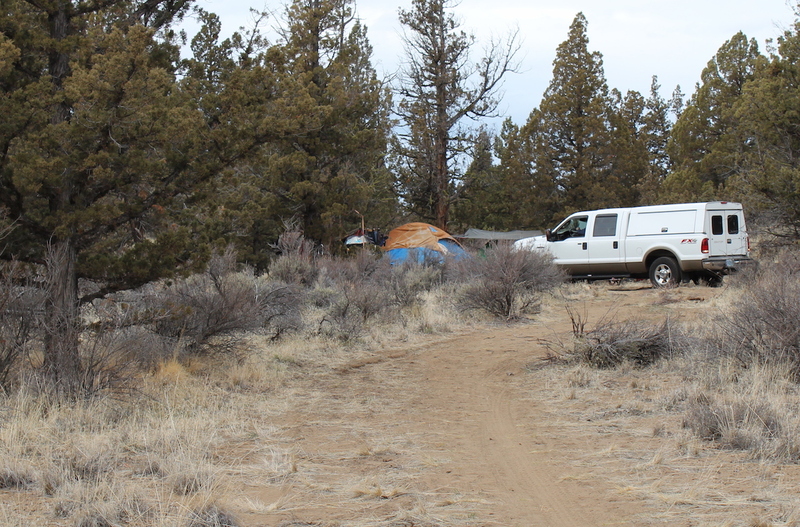 There’s another element to the volunteers’ service: A clean camp increases the likelihood of staying under the radar, avoiding the ire of law enforcement and surviving in the juniper forests of Central Oregon. The services augment the homeless campers’ resiliency and resourcefulness. But even more importantly, they bring human connection and compassion. AMONG THE OUTREACH TEAM’S core volunteers, Len De Groot, 72, is a kind and patient man who also serves as COVO’s secretary. Roy Crafts, 67, is the most gregarious of the bunch, but he has zero tolerance for any nonsense a camper might try to pull. Jim Milam, 69, is tall and slender with a trim moustache. Detail- and task-oriented, he does all the paperwork associated with the visits. The newest member, Merv Abe, 67, joined the outreach team 10 months ago. Some homeless people will call or visit COVO, asking that the volunteers visit. “If they say they’re there, we’ll find them,” Roy says. Other times, a COVO employee or volunteer will discover camps as they’re driving around town. J.W. Terry, COVO’s executive director and a Navy veteran, says, “You don’t look around town the same” after doing camp outreach. The men share common reasons for why they volunteer with COVO: They wanted to be involved with a veterans organization, to have something to do in retirement and to be of service. “The reward that I really like is being able to serve people that need it desperately,” Len says. Terry estimates that more than half of the homeless people COVO serves are not veterans. The need among Central Oregon’s homeless population is so great that it would be wrong to discriminate, he says. 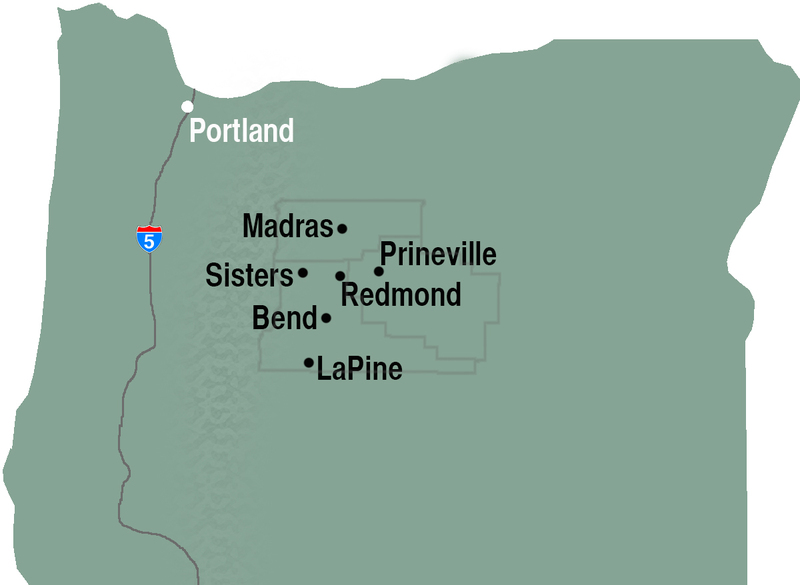 And they all agree that they have not discovered the majority of camps around Bend. “We’re just a drop in the bucket,” Len says. EACH TUESDAY BEGINS the same. The men gather for coffee and chitchat in COVO’s offices before 8 a.m. They pack the bed of Roy’s Ford pickup truck with supplies. They also pack socks. “Everybody wants socks. We’ll be out before we get back,” Roy says. Silverado up to COVO’s parking lot, where a small trash trailer is stored. He hitches the trailer to the truck, and once that is done, the group is ready to set off. They first stop at the Family Kitchen, a Bend service agency that serves meals for homeless people, to pick up the sack lunches. They arrive before 9 a.m.
Any other week, the lunches would have been ready. But the man who prepared the lunches died the previous weekend. The four men quickly assemble three dozen lunches, which include egg salad, beef and cheese, and peanut butter and jelly sandwiches, boxed juice, fruit, bags of chips and granola bars. Len de Groot, 72, and Jim Milam, 69, prepare sack lunches for their weekly visits to people living in Central Oregon's high desert. They have met all manner of people. Some became homeless as a result of post- traumatic stress disorder, alcoholism or drug addiction, mental illness, poor health, unstable family situations or because they’ve been priced out of Central Oregon’s housing market. There is routine to the volunteers’ work – loading up trash, handing out supplies, seeing the same people each week – but the day is often punctuated with odd and funny moments. They once saw a woman “in her birthday suit, running through the trees,” Roy says, laughing. “That’s not something you really want to see, not even once,” Jim says. They’ve rarely felt uncomfortable or in danger. They are, after all, Vietnam War veterans and have handled themselves in terrifying situations and could do so again. Some people they help occasionally become combative. In those cases, the volunteers take a couple of weeks off from the problematic campsite and come back when the relationship improves. In other, rarer cases, the volunteers cut ties altogether. The volunteers helped one man, whom Len described as paranoid, for years until one visit when he unexpectedly began screaming homophobic and racial slurs at them. “We decided that we would no longer service (that man),” Len says dryly. Some camps are simply too remote, by design. The only way to get to them is by walking. “They don’t want us,” Roy says. THEY DRIVE NORTH on Highway 97 and turn right onto a dirt road that leads to a padlocked gate. A metal sign on the gate reads: WARNING TRESPASSING PROHIBITED. combination, opens the gate, then closes it after the trucks pass through. The lock’s combination is a closely guarded secret. The volunteers never share it with the people they help. According to the agreement between COVO and the Central Oregon Irrigation District, the volunteers will open the gate to allow a homeless person to drive out of the land but never to drive back in. Unable to easily leave, the choice to live on that land becomes a tacet commitment to stay. They drive on a gravel road that runs parallel to the canal, kicking up dust. Within minutes of driving, they’ve left the city behind. All that can be seen are the road, juniper trees and sagebrush. It is quiet, save for the sound of the occasional car, a gust of wind moving through the trees or raindrops pelting packed dirt. There are no road signs, no sense of direction, just endless juniper trees and narrow dirt roads connected to one another with little rhyme or reason. The volunteers rarely get lost. Len uses the GPS in his truck, which draws a thin blue line of where they drive. “It’s just a trail in the sand,” he says. The camps are far from one another, often beyond eyesight of each other. The first man they visit lives in a small camper van tucked in a stand of juniper trees so thick that the van is completely hidden from view until the trucks round the last turn on the road. A tall, slim man walks out to meet them. His hands are stuffed inside the pockets of a hoodie, and he keeps his head down. With the exception of “hello,” he hardly says a word. Len carries a couple of full garbage bags to the trash trailer while Roy and Merv fill a bag with supplies. As they do so, Jim, clipboard in hand, writes down some basic information, which COVO uses for record- keeping and grant applications: the person’s name, last four digits of his Social Security number and which supplies he is given. The whole interaction lasts less than five minutes. He is one of many campers who have taken time to warm up to the COVO volunteers. The campers are happy to have their trash picked up, but creating a relationship and rapport, in some cases, take time. “They’re real leery of other people coming into their lives,” Len says. Merv says one camper would not talk to him at first. Len de Groot, a volunteer with Central Oregon Veterans Outreach, loads trash bags into a trailer. COVO, a Bend-based social service agency, provides supplies and maintenance to homeless campers in the forest. Despite the inherent misery undergirding their work, the men have a fun time. Roy and Len often tease each other about their trucks: the loud diesel engine of Roy’s and the size of Len’s. They successfully back out and drive down a dirt road, passing two large abandoned camps. They are complete messes: collapsed tents, blue plastic tarps left in piles, bikes, mattresses and random bric-a-brac piled together. The COVO volunteers never clean abandoned camps. They also don’t help people move their camps. They drive up to a large camp made from two tents pitched next to each other and covered in tarps strung up to posts and nearby juniper trees. An older man, bearded and wearing camouflage pants, greets them. He, like many of the campers, expects them. The bags of trash are ready, and a 10-gallon water jug lies on the ground near where the volunteers park. He has a couple of small solar panels for power, as well as an antenna, which he built, that allows him to pick up television stations. Many of the campers are similarly resourceful. They have generators for electricity, propane heaters for heat and cooking, televisions and other amenities to make their lives comfortable. They’ve adapted to living outside in the elements for the long term. The next camp is hardly more than a large tent nestled around large sagebrush and juniper trees. Roy drives his truck up, but no one comes out to greet them. They drive on, pulling up to a large camp spread out, off one side of the road, in a clearing behind a stand of junipers. The camp is dominated by two large structures that resemble stick-built homes. They’re one-story buildings without windows, but large enough for comfort. Three dogs run out to greet the volunteers, who are prepared with dog bones. Joe, a man with a beard and shoulder- length hair, carries garbage bags up to the trailer, which he and Len throw in. His partner, Joy, talks with Roy, Jim and Merv as they stuff a garbage bag. Joy and Joe have lived in that space, along with their three dogs, for four years. Bud, a 54-year-old man with a salt-and- pepper mustache who keeps a pair of reading glasses perched atop his head, joined them nearly a year ago. The three have coffee together each morning by a campfire in the middle of their camp. At night, they watch movies together, using a TV and DVD player powered by a generator. Joy and Joe’s home has three rooms. A gust of warm air greets people as they walk through the door to the sitting area, furnished with a small couch and chairs. The middle room is the kitchen, where the couple do all their cooking. Their bedroom is in the far back. The camp also has space for storing their winter gear, other supplies and their garbage. The gravesite of Bud’s dog, who was killed when he ran onto the highway, takes up space in between the two homes. Bud has been homeless off and on for 15 years, a situation propelled in many ways by alcoholism. Before his latest bout of homelessness, he had a job and an apartment with a roommate. But the roommate died, and Bud’s landlord would not accept the new housemate Bud found. He is sober again. And he’s hopeful he will not be homeless for long. “You can always climb back up the ladder if you want to,” he says. He’s been thinking about it more and more. Most of all, he says, he needs prescription glasses. The COVO volunteers leave after a brief visit, driving for a few minutes before arriving at a camper van parked in a clearing. Roy knocks on the van’s door. There is no answer. The volunteers know that this person works full time, in construction. They suspect he is working. His camp is messy. Empty milk jugs, tin cans and plastic motor oil containers litter the ground, and papers flap in the breeze. “He’s got a little bit of an excuse,” Len says, since he works, but camp clean-up is something they often discuss. The previous weekend had been windy. THE CREW DRIVES BY another abandoned camp before rounding a curve to a large open space where two dirt roads converge. As the men get out of the trucks, they are greeted with a shout. Ronnie is slim and muscular, with jet black, buzz-cut hair and a trim mustache. He looks younger than his age of 52. He is energetic, alert, fidgety. His home, amid three juniper trees, is sturdy, square-shaped, built from plywood sheets and wood. A long cafeteria table serves as an outdoor kitchen, with room for food prep, cutting boards, knives and other utensils that are neatly laid out. At the far end of the table is a fire pit, surrounded by a walls of gray lava rock on three sides for cooking. Nearby are two abandoned camps that Ronnie, his partner and a friend are cleaning up. “Might be leaving for work pretty soon,” Ronnie tells the men. Ronnie, who worked as a construction contractor, says a friend may have hooked him up with work at the Hoover Dam, at the Nevada-Arizona border, laying asphalt and concrete. Ronnie is quick to say that he’s not always been homeless. He’s certified to operate heavy machinery and lay out asphalt and concrete for roads, he says. He’s also worked as a house painter, but when the recession started, he lost the majority of his work. He’s clearly proud of what he has built for himself. The structure is 30-square feet with a 12-foot ceiling. It’s spacious inside, he says, with room for a living area with a couch and TV, as well as a bedroom area and a separate storage area. He uses a generator for electricity and propane gas for the space heater that keeps the space “toasty.” Like Joy, Joe and Bud’s camp, Ronnie’s is semi-permanent. They are self-sufficient and live as comfortably as they can despite being homeless. It makes one wonder how the lives of Portland’s homeless people would change if they were allowed to camp in one place, free of police sweeps and chaos, for months or years at a time. Ronnie has a makeshift garbage dumpster, which he built from wooden pallets nailed together in a large square box, more than 50 feet from his home, underneath a tall juniper tree. Dozens of black garbage bags, stuffed full, are piled inside. Jim asks if it needs to go. “Yeah,” Ronnie says, matter-of-factly. “All of it.” They laugh. Len backs his truck up to the pile while Roy and Merv fill the new garbage bag with supplies and Jim fills out paperwork. Ronnie is as resourceful as a homeless person can be. But still, he is deeply grateful to see the COVO volunteers each week. “Thank you!” he shouts, as the trucks drive away. They next visit a camper van where a couple live. They are not home, but they’ve left a cardboard sign asking for propane and water, next to four empty gallon milk jugs. The volunteers move on to another camp made from two large tents covered in tarps. A skinny man with long hair and a beard walks out to greet the volunteers. He has three full garbage bags with him. The man is not having a good day, he tells Len and the others. His leg is healing from a break, and he suffers from regular back pain. He tells the volunteers he recently visited his doctor, who refused to give him a prescription for hydrocodone, a prescription opiate he used to take for the pain. “She says I was a possible addict,” he says. “Do you think that’s because of your living conditions?” Jim asks. “Yeah, because I’m homeless. I don’t like this lady.” Jim encourages him to go back to the doctor. “I’d rather just stay here,” the man responds. “I don’t need to deal with that.” He started talking about his childhood, about an older brother who beat him regularly. “He just can’t handle people being domineering over him,” Len says. The volunteers are out of water, which happens every week at this point in the day. They drive to an Arco gas station north of Bend to fill up. The volunteers meet up with a half-dozen campers at the end of a cul-de-sac, then drive to a church east of Bend, where they meet up with a man they’ve been helping for five years. He’s in his late 60s, Len says, describing him as “god-fearing” and “gentle.” He lost all his life’s savings during the recession. He receives Social Security, but his son defaulted on a student loan, and those checks are now being garnished. The man is waiting for them in front of the church. He’s jumpy. He sticks to himself, Len says, and obviously wants to keep the conversation short. “God bless you, too,” Len responds. The man qualifies for subsidized housing, including Section 8, which would pay two- thirds of his rent. He is an Army veteran and could also be eligible for Veterans Affairs Supportive Housing vouchers, which would contribute the same amount toward rent. The COVO volunteers talk to the people they meet about moving into housing and whether that is something COVO can help them with. The man they met at the church isn’t convinced it’s worth it, Len says. They’ve also talked with Joy and Joe about housing. But they won’t part with their three dogs, which probably prohibits them from passing screening criteria for rental housing. Others seek to detach themselves from society and live in isolation. One of the first people Len helped when he started volunteering was a Vietnam War veteran “who just loved being by himself in a tent and reading. So as long as we brought him a couple of books, he was happy,” Len says. Roy Crafts, a volunteer with Central Oregon Veterans Outreach, drives to a homeless camp that he and other volunteers visit on Tuesdays. COVO is a Bend-based social service agency that serves homeless people. IT’S NEARLY 1 in the afternoon. The trash trailer is full, and the four decide to split up. Len and Merv head to the dump while Roy and Jim visit the remaining camps. Roy drives south, then turns onto China Hat Road, which runs through an area south of Bend owned by the Deschutes National Forest. The forest of tall ponderosas is more open, and Roy slows the truck down often so the men can peer through the woods for any sign of a camp they haven’t yet seen. The Forest Service recently posted signs warning of an impending controlled burn, encouraging campers to leave. The burn has not yet happened, but many of the campers have left; there is hardly any evidence of the camps that used to dot the area. They spot a camper van they have not seen before parked in a turn-off and pull-up. As they walk up, a small dog barks from inside. A young man gets out. Roy explains who they are, the nature of their visit. “OK, cool,” the man says. He says his dog is named Tupac. “Sure. Yeah.” The man sounds relieved at the suggestion. “There’s some hygiene kits,” Roy says as he stuffs the bag. “These are for puppy.” He puts some dog bones in the bag. The man and Jim talk, and Roy stuffs the bag with sandwiches, muffins and bread. It starts to rain, cold, large drops that quickly soak through clothing. Jim encourages the man to visit COVO. He says he will and tells Jim and Roy that there is someone living in a car not far off. “God bless!” he shouts as Roy and Jim leave. His voice reverberates in the forest. from Portland a week ago. “Stayed with his mom and his stepdad. in the driver’s seat of a four-door sedan. Jim walks up and starts a conversation. Roy walks over a bag of supplies. The man says he doesn’t need anything but still takes the bag. “That car’s been out here at least two weeks now,” Roy says. The last camp they visit is their favorite. A family of four – husband, wife, 14-year-old son and 4-year-old daughter – live in an RV parked in the forest. The husband works full time. Each morning on his way to work, he drops their son off at high school. The mother stays with their daughter. The mother has gone to great lengths to shield their daughter from the fact that they are homeless, Jim and Roy say. They’ve built a tire swing for her on a nearby tree. They go for walks in the forest, and the mother has been teaching her about the wildlife and plants around them. Their space is spotless. There is not a single object on the ground outside the RV. The woman mentions talking with a Forest Ranger about the controlled burn. She had asked him when it was going to happen, so they could plan their departure. The man told her not to worry about it – that it probably wouldn’t affect their camp. So, they’ve stayed. “I thought of you the other day,” Jim says to the little girl. He tells her he has grandchildren the same age as her. He gives her two books –a puzzle book and a storybook. Roy puts some chocolate muffins they’ve saved specifically for the family in the bag of supplies, along with a couple of fleece blankets. They say goodbye and see you next week. The volunteers are done for the day. They head back to COVO, leaving behind tire marks in the sand and a touch of human decency, until the next Tuesday.